Silke Vandenberghe, allround creative, parttime viking, tattoo collector, co-organiser and creative brain of diverse FisherKing events. 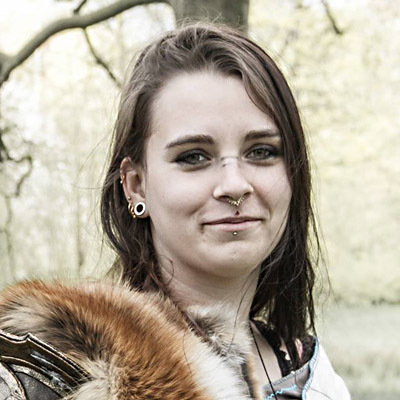 Besides having a bachelors degree in orthopedics specialising in the aesthetics of prosthetics and teaching her skills, Silke is the founder of Pandora Dolls, a company focussing on historical reënactments, LARPs and cosplay. After focussing on mixed media sculptures and art dolls for 6 years she shifted her attention to costuming, ranging from victorian inspired steampunk attire to full blown winged and horned fantasy costumes. You name it, she makes it.